According to the Federal Reserve, the value of U.S. manufacturing output in 2008 was $2.946 trillion, measured in 2000 dollars. 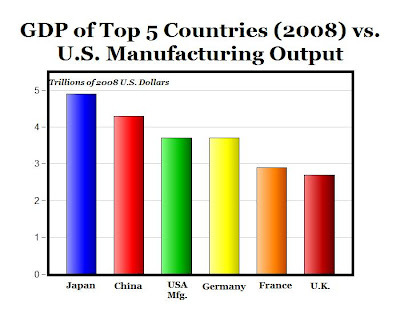 Converted to 2008 dollars (link), that would be about $3.7 trillion, and the chart above shows how the U.S. manufacturing sector compares to the entire output, or GDP, of the top five largest economies in the world in 2008 (data): Japan ($4.9 trillion), China ($4.3T), Germany ($3.7T), France ($2.9T) and U.K. ($2.7T). Bottom Line: If the U.S. manufacturing sector were a separate country, it would be tied with Germany as the world's third largest economy. It would also be larger than the entire economies of India and Russia combined. As much as we hear about the "demise of U.S. manufacturing," and how we are a country that "doesn't produce anything anymore," and how we have "outsourced our production to China," the U.S. manufacturing sector is alive and well, and the U.S. is still the largest manufacturer in the world. Yeah, it's ridiculous the way they act like we do nothing of value. Sounds like the trade deficit and soaring unemployment will soon be a thing of the past. I wonder how long the US will continue to be the largest manufacturer in the world? How much of this manufacturing is for defense? Regardless, things could be much better for manufacturing, and the US, if the gov't didn't have so many oppressive regulations and taxes. It confuses me that a free-market economist would champion the "all is well" mantra, when it's typically used to sanction the government's overinvolvement. The issue is between value added in manufacturing and manufacturing jobs. Manufacturing has been increasing productivity so that the jobs in manufacturing have been decreasing as productivity increases. This is much the same as what happened to the Ag sector between 1880 and 1940 when productivity in Ag went up and employment went down. Now there is an interesting question as to if we will have to go to bread and video games to keep the populace satisified. Anyone have a good list of the top number of items manufactured here in the good ol' USA? Wanting to see a ranking in dollar terms. Producitivty increase in mfg is wonderful but the fact is that inputs into the final product are increasingly foreign sourced. Thus, the final product is a compilation of of foreign parts. The more accurate headline is: The U.S. is the world's largest assembler of manufactured goods. Manufacturing jobs are disappearing somewhat because of productivity but mostly because of foreign sourcing. If we had statistics that kept track of foreign inputs into manufactured (assembled) products the smugness would dissapate. That's some interesting and heartening data, but I can't think that it would be more relevant if it was expressed on a per-capita or percentage-of-GDP basis. The numbers show the us with 1.5 T of value add and the next country is Japan at 960B, china at 748, Germany at 565B and Italy at 291b. For example when the recent hub bub about foreign wind turbines was bouncing around they conveniently omitted the fact that the towers and blades are made in the US. Its only some of the parts in the hub where the generator is that would have been made in China. Lyle, The world's biggest mfr. of wind turbines is Denmark based Vestas. I argue that the U.S.A. mfrg. is becoming an assembly of foreign parts. China mfrg. is an assembly of Chinese made parts. The lump sum total manufacturing does not distinguish foreign components in the U.S. but almost for sure it does in Chinba. Oooh, that's easy to say. Show me the data. Craig, Please e-mail Secretary of Commerce Gary Locke and tell him you want figures broken down for foreign inputs into manufacturing GDP. This is is a hidden statistic right now BUT with a lot of encouragement we might be able to get a change. Uh, what happened to France which, by your own source, had a higher 2008 GDP than the U.K. and Italy? Carl: Thanks, you're correct, and I have updated and fixed the chart. Thanks for pointing out my mistake, and I apologize for the original incorrect graph. > Now there is an interesting question as to if we will have to go to bread and video games to keep the populace satisified. THIS IS A POST-INDUSTRIAL ECONOMY. Now, that was something which was grasped even back in the late 60s and early 70s. The term "post-industrial" was used because they didn't KNOW at the time what sort of economy followed an industrial one. It's called an "IP and Services Economy". Almost all new wealth comes from providing IP and Services. Bill Gates is the "IPSE Rockefeller". Manufacturing jobs are guaranteed to become a thing of the past, as robotics and such slowly supplant human actions in the production of manufactured goods (currently, the vast supply of cheap foreign labor is being used to bootstrap those economies in place of robots, but that is a temporary thing until the standard of living in those places has been raised to the level where they can readily expend the effort needed to educate their own populaces up to the point where they can join the IP&SEs (of which the USA is the main one at this point). Just as only 2-3% of the population produce the food not just for this nation but for many others, so, too, can we expect 2-5% of the population to do the same for manufactured goods once robotics does much the same to industry that mechanization did for agriculture. THIS SEEMS REALLY SORT OF 'DUH'. People don't need "bread and circuses to keep them preoccupied (though leisure is certainly likely to increase). There are a vast array of useful things which an intelligent, educated, and well-trained populace can do in terms of production of IP and services. IP and Services on the national level are likely to specialize quite a bit, matching up with national dispositions and social structures. The USA will remain a pre-eminent source of original creative ideas because it's in our polyglot culture to figure out what works for a wide range of peoples, and our independent natures automatically tend to nurture a wide array of creative influences. The idea that nations should be "self-sufficient" is inherently ignorant of not just reality but obvious economic concepts such as comparative advantage. P.S. I'd also suggest that it is imperative for the USA to stop attempting to train its work force for mindless manufacturing jobs using the sheeple-producing Germanic System of Education and start aiming, from the child up, for a self-directed, creative, and independently able workforce. That's not coming from the NEA and Public Schooling. It's going to require a revolution in education that can only come when people start demanding their kids get the kind of education that the Founding Fathers got, and found in the American populace in 1780. People need to start asking themselves the question -- how do we get there from here? Important to understand the data. I would like to know which country get credited as "Manufacturer" when, for example, a US Multi National Corp., manufacturers goods in China, and books the sales as a US Corp. Is that considered US Manufacturing? All the items with a "Made In China" label, be it US, German, etc., companies, Joint Ventures, Partners, booking the sale in their country, are these sales counted in their Manufacturing or in China's 100%? Here's my concern about these numbers. Do these numbers reflect products manufactured by American companies with plants in places like Canada and Mexico? Are we giving ourselves credit where credit isn't due? The greatest argument against this data is from folks who blame NAFTA for the loss of American jobs. In 2009 China overtook the US to become the largest manufacturer. But its not about numbers. Second is as good as first. Except, the US has stopped manufacturing, most electronic components,chips, TV sets, iPods, phones and just about any item you can think of, including shoes which are still made in the UK. Go figure. A common refrain is, the US does not make Wal Mart goods! but much of the high end machinery. This is true, only to some extent. Much of what the military industrial complex makes is over valued and not transferable. The tech in the F22 raptor is great but that factory is a write off unless demand for the F22 is infinite. Also, those who deride manufacturing should know that national producers axe jobs overseas first. So tell me:It is really so much better to flip burgers than to work on a lathe machine? 4% of the world does 45% of its military spending, and now manufactures practically nothing that a household can use. I'm not referring to the actual house. This case of warped priorities will be our downfall. More importantly, we pay only lip service to bringing manufacturing back. Most americans do not want factory jobs. We should pay them more to entice them and robotize the menial work to take away the traditional grunge associated with the factory. I am shocked to see how many people here are shocked to learn the US is still the world's largest manufacturer. Wake up people or have you been drooling like zombies in front of the television watching left-wing media all your lives?! OBloodyHell, you are exactly right. The myth in the media to have people believe we are producing nothing goes exactly with the mantra of the US being rich and fat and blah blah blah. rjs, if you don't measure by dollar value than how do you want to measure output? I'm really curious to you learn of your logic. Are you implying that a t-shirt should have the same value as an F-16? juandos, the US will remain the world's largest manufacturer for the next few years at least. However, China will inevitably surpass the US in manufacturing no later than 2015 in my view. However, even when China does remember that one thing: Who owns those factories in China? Yes, that's right. Although it may seem so many things you buy in the supermarket are being made in China, it doesn't mean it's being made by China. That's right. It is much more important you look at that big name (ie, the Brand) written on the box, like Hometrends (a Walmart brand). Hometrends, a brand of an American company owned by American shareholders, is the one who owns that factory in China. Remember that. Lyle, you're right about manufacturing jobs in the US decreasing. Efficiency is getting ever better. This means that Americans are getting ever more efficient as the value added per worker in the manufacturing sector is enormous in the US (we are very effective and efficient), but also means there are less (manufacturing) jobs in the US. At a current 9.7% unemployment rate it does kind of make people wish we could bring back all the lost manufacturing jobs. In fact, the number of manufacturing jobs in the country today is at about the same level as in the late 1930s. Quite sad considering that that was the era of the Great Depression and 80 years have since passed not too mention our population has grown substantially since then. However, then again this is all characteristic of a very industrialized, actually post-industrial, country like the USA. We have moved from manufacturing to services. It is also noteworthy to mention that although manufacturing jobs in the US is decreasing, so too is it happening around the world. It is simply us, humans, becoming more efficient. Would you prefer we become better at what we do or just have a bunch of fake, meaningless jobs for the sake of handing out paychecks? I say we continue becoming more efficient and effective and if that means loosing jobs then we need to find other areas to have more jobs. PS, nationmaster.com is not a reliable source of information. I think after a few times of using it you will realize its "statistics" are totally random and totally contradictory to official professional statistics giving out by say the UN, Federal Reserve, Dept of Labor, CIA, etc. If I were you I would question where nationmaster gets its (seemingly random) information from. James Fraasch, I'm sorry I don't have any statistics currently with me on what are the largest items being manufactured. However, if I were to take a knowledgeable guess I would be certain that heavy machinery, food and beverages, medicine, software, and aircrafts are the top items being manufactured in the US. The US is in fact the world's leading manufacturer of aircraft, medicine, and computer software. I am not certain, but I believe it is also the leader in semiconductors and heavy equipment machinery as well. And these, keep in mind, have much more value than shirts and plastic toys that are manufactured in (largely US-owned) factories in China (or other under-developed countries for that matter). gettingrational, it seems you have been victim to the left-wing hysteria that would have you believe everything is outsourced and lead you the conclusion that we are just assembling the products here. It may seem so since of course raw materials often do not come from the same country that manufactures the finished product. However, I'll just give you an interesting fact to consider: The US is the world's largest manufacturer of airplanes and airplane PARTS. Evil Red Scandi, manufacturing is only 12% of US GDP. However, like I mentioned earlier, keep in mind that manufacturing as % of GDP is not so important. We are a developed country, a post-industrial economy, which means that we are more focused on services than manufacturing. The days of the assembly line and Henry Ford and all those big auto factories are over. That was so last century. Dr. Torch, of course a lot of this manufacturing is for defense. It would seem quite logical given that a large portion of our budget is after all defense. In fact, the US is the world's largest arm manufacturer. Keep in mind, for instance, all those aircraft being used in the militaries of western (NATO) countries like Israel, Australia, the Netherlands, Canada, etc. From F-16s to F18s to C-130s, they are all manufactured in the US (by American companies such as Lockheed and Boeing) and sold to foreign governments. Martin, that is an excellent question! Unfortunately, when a US-based company has a factory in lets say China, the products from that factory are not counted towards US manufacturing or US GDP, but are calculated towards China's. That is sadly how Gross Domestic Product (GDP) works. It calculates the value of good and services (manufactured in a given time, usually a year) within a country's geographical borders. The same of course goes for calculating manufacturing. So, yes of course GDP (and as a result of it our calculations on manufacturing) are very flawed.